The remains of one of the Disappeared, Kevin McKee whose body was found 43 years after he was abducted was laid to rest beside his mother at Blaris Cemetery, in Lisburn. Kevin McKee’s sisters choked back tears as, 43 years after his murder, they carried his coffin into St Peter’s Cathedral in west Belfast. The body of Mr McKee was found along with that of Seamus Wright in a shallow grave on reclaimed bogland in the Republic in June. They were found during a so far unsuccessful search for the body of another man, Joe Lynskey. The University of Ulster’s Conflict Archive on the Internet – which provides an extensive list of Troubles fatalities – records all three men as having been IRA members. 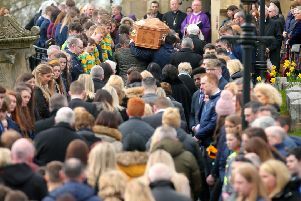 Priest Fr Michael Murtagh said yesterday: “It is important to have a Christian burial, but when you are doing it 43 years late it can take on a whole new meaning. “It is important for Kevin and it is important for his family that we do this and we do it well.” Mr McKee, who was abducted shortly before his 17th birthday, and Mr Wright, 25, both vanished in Belfast in October 1972. The IRA shot them on suspicion they were working as British agents. Mr McKee’s disappearance took its toll on each family member, the priest said. “We acknowledge 43 years of pain, of wondering, of uncertainty and not knowing what had happened. “We acknowledge that at times there were very few to turn to and it was a lonely road for them to travel. “You lost Kevin but also lost a place to remember him. You did not get a burial. The search for the Disappeared has been overseen by the Independent Commission for the Location of Victims’ Remains (ICLVR), an independent body set up during the peace process to find 16 victims secretly buried by paramilitaries. Their relatives carried candles to the front of the church as each name was read out during the service.